Can acupuncture help alleviate menopausal symptoms? New Rochelle, NY, March 20, 2018–An umbrella review from Duke Clinical Research Institute that was a comprehensive assessment of previous systematic reviews and randomized controlled trials has found that women who received acupuncture had less frequent and less severe vasomotor symptoms associated with menopause than women who did not have acupuncture. The women who had acupuncture also reported improved health-related quality of life, as shown in the evidence reported in The Journal of Alternative and Complementary Medicine (JACM), a peer-reviewed publication from Mary Ann Liebert, Inc., publishers dedicated to paradigm, practice and policy advancing integrative health. The article is available free on JACM website. In the article entitled "Management of Menopause Symptoms with Acupuncture: An Umbrella Systematic Review and Meta-Analysis," coauthors Deanna Befus, PhD, RN, Wake Forest School of Medicine (Winston-Salem, NC) and colleagues from Duke Clinical Research Institute, Duke University, Durham Veterans Affairs Medical Center, Duke University Medical Center, and Duke University School of Medicine (Durham, NC) conducted a thorough review of studies that assessed the effectiveness of acupuncture for vasomotor symptoms and any adverse effects of treatment in perimenopause and postmenopausal women. The researchers note that the statistically significant differences found between acupuncture and no acupuncture could be due at least in part to nonspecific effects of the treatment. Lead author Befus notes that she was "impressed with the notable improvements in vasomotor symptom frequency, severity, and several quality of life measurements with acupuncture compared with no acupuncture. The evidence of benefit of acupuncture for bothersome vasomotor symptoms is compelling." "Notably while follow-up time of included studies varied, some found reductions in hot flash frequency that continued for a year," says JACM Editor-in-Chief John Weeks, johnweeks-integrator.com, Seattle, WA, "This presents real promise for patients wrestling with bothersome vasomotor symptoms." 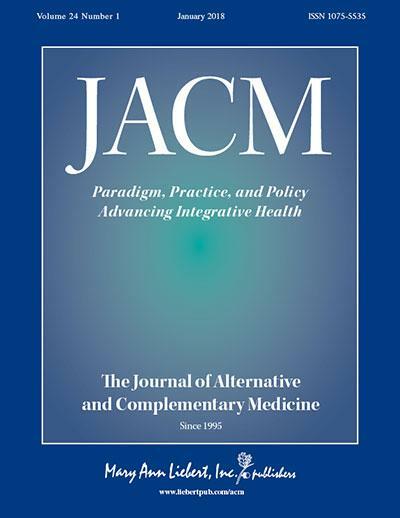 The Journal of Alternative and Complementary Medicine (JACM) is a monthly peer-reviewed journal published online with open access options and in print that is dedicated to research on paradigm, practice and policy advancing integrative health. Led by John Weeks (johnweeks-integrator.com), the co-founder and past Executive Director of the Academic Collaborative for Integrative Health, JACM publishes human clinical trials, observational studies, systematic reviews and commentary intended to help healthcare professionals, delivery organization leaders, policy-makers and scientists evaluate and integrate therapies into patient care protocols, payment strategies and appropriate protocols. Complete tables of content and a sample issue may be viewed on the JACM website.